If you are preparing an essay or research paper for college, the chances are high that you are going to need a few tips on writing an essay MLA style. More often than not, when you get on the college level, there are two writing styles in which professors are looking for, they are APA (American Psychological Association) style or MLA (Modern Language Association) style. The differences are varied. MLA style is commonly used in many colleges throughout the U.S., so learning the style and tips on writing in MLA style will serve you well throughout your college education. 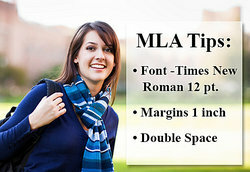 The MLA essay format meets the standard layout guidelines as set forth by the Modern Language Association. Set your default font as Times New Roman, 12 point. Indent the first lines of each of your paragraphs exactly one half-inch from the edge of the left margin. When doing your indents, use the tab key instead of using the space bar. Double space throughout your essay. Endnotes should be listed on a separate page, directly before your bibliography or works cited page. You need not make a title page unless your professor requests it. On the first page of your essay you should type your name in the upper left corner of the page. On the line directly below your name, type in your professor's name and below that you should type the name of the course, and finally below that you should write the date in which you are typing up the material. Center the title of your essay on the line below the date. Use italics to emphasize any titles of longer works that you are referencing. If you have sections, then you should use numbers followed by a period in order to divide them accordingly. For example, if you had three sections that you were going to discuss within your essay you would number them like so, "1. Section One, 2. Section Two, 3. Section 3" and so forth. After each number be sure to space once prior to typing in the section name. MLA style references a bibliography as a works cited page. When typing up your works cited page there are a few things that you should do. Depending on how many sources you have and the type of sources that you used (whether a book, article, or Internet-based source), then you will want to pay special attention to the author's name, title of the book, publication date, publisher and place of publication. Johnson, James. U.S. Trade Relations. New York: Hummingbird Press, 1989. Print. Main, Jerry. Campside Sounds. Boston: Rice Press, 1992. Print. While the above sources are simply fictional samples and do not reference real books, it gives you a better idea on how to format your bibliography (works cited). "Tips on Writing an Essay in MLA Style." YourDictionary, n.d. Web. 24 April 2019. <https://grammar.yourdictionary.com/grammar-rules-and-tips/tips-on-writing-an-essay-mla-style.html>.